I have been reading lately that pumpkin seeds have all sorts of healthy benefits. I know they are delicious tossed into a fresh green lettuce salad to add some crunch. So, I have been trying to come up with different and interesting ways to incorporate them into the home culinary landscape. 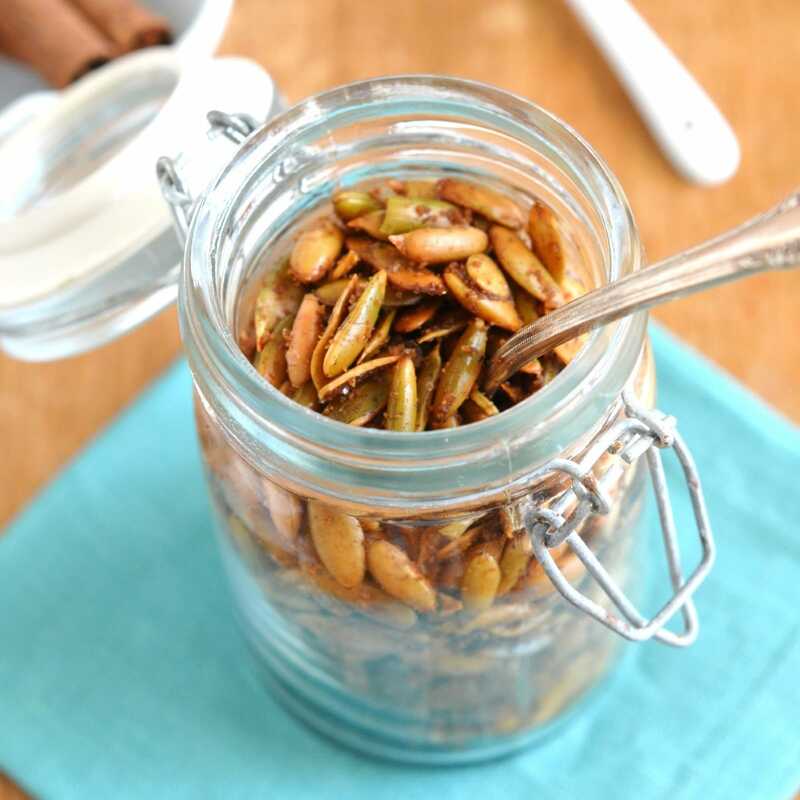 These Cinnamon Roasted Pumpkin Seeds are a twist on the usual roasted pumpkin seeds. The cinnamon sugar combination in this recipe gives the plain raw pumpkin seeds a boost of flavor. I found a bag of raw pumpkin seeds for a very reasonable price and used most of the bag for this recipe. The original recipe has been adjusted just slightly by changing the oil to coconut oil and the sugar tococonut palm sugar, which are both my preferred choices these days. Cooking at a relatively low temp, 300 degrees, allows the pumpkin seeds to cook slowly and not burn. You might want to adjust the amount of sugar, cinnamon and salt to your liking. Ghee may work as a replacement for the coconut oil, however, I have not tried this substitution yet. If you do, please do let us know in the comments. 🙂 Check out this post for a tutorial on how to make your ghee. P.S. – Your house will smell amazing as these are baking! Eat them on their own or toss into your favorite ice cream. Hope you are having a great week! Enjoy! An easy, tasty snack using raw pumpkin seeds. Peheat oven to 300 degrees F.
In a medium sized bowl, place pumpkins seeds, cinnamon and coconut oil. Toss together until well blended. Bake in the oven until pumpkin seeds are lightly toasted, about 40 minutes. Previous Post: « The BEST Blueberry Strawberry Smoothie! 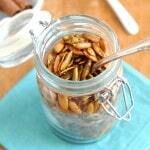 A nice alternative to bland or too salty pumpkin seeds! Thanks! And they are so easy to make!